I came home from the IOLI convention and was so inspired that I immediately started a Downton lace pattern on my bolster pillow. Also, I bought some more Downton bobbins from John Aebi at the convention, so now I have enough to use for this pattern. This pattern uses 44 bobbins plus 2 gimps. 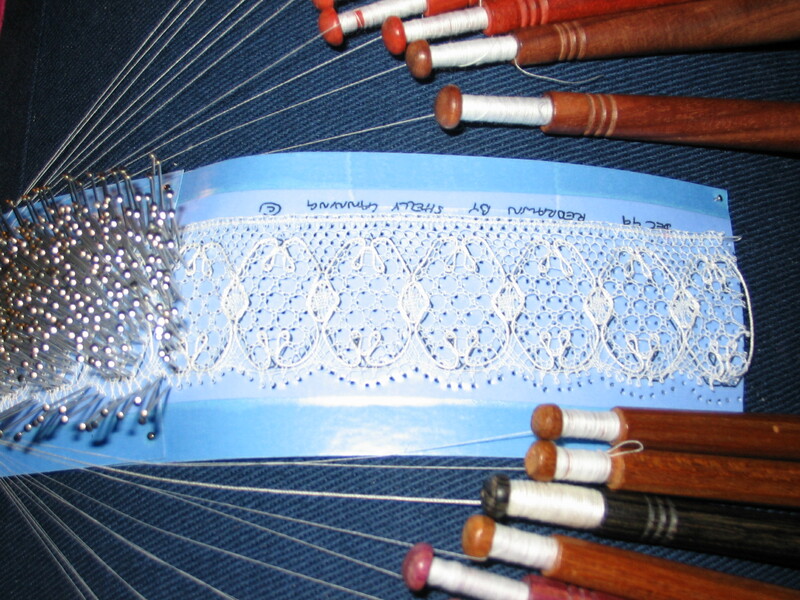 (Downton doesn’t count bobbins in pairs like other laces do, even though they are still used in pairs and the stitches are essentially the same.) The bobbins are enchanting for me. It takes getting used to because they are very short and harder to grasp. They are also so smooth that at first they were slipping out of my hands! 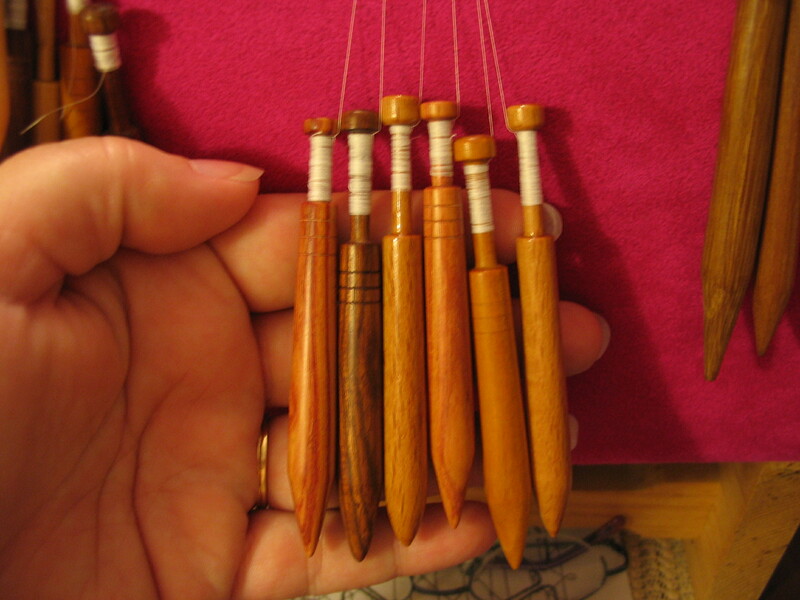 I have a combination of bobbins from various sources. I bought some on ebay; they are not as smooth and very light. I bought some from other supplier that I can’t remember that name; the bobbins are the right size, but their shape is not as pointed as they should be and they feel a little heavier/denser. I have 2 pair that I bought from Pompi Parry from England, the size and shape is nice. The Aebi bobbins are so smooth! He has continued to revise the shape after talking with Pompi. From left to right these are Aebi (2008), Aebi (2004), Pompi, Aebi (2008), Aebi (2004), and Pompi. 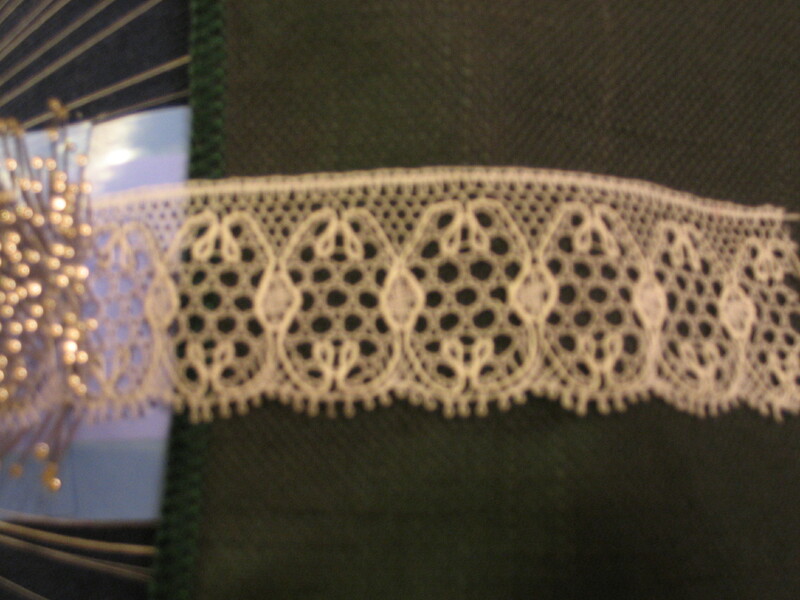 The pattern I’m doing is #130 from 32 Downton Lace Patterns by Shelly Canning. What sort of thread are you using? Hi, I usually use cotton 140 thread. I can’t remember the brand and I think I’ve lost the package wrapper along the way. Sometimes I’ll use 120 but it depends on the pattern.